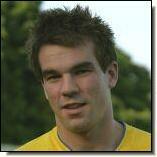 A 6ft 7 central defender who rejoined the Saints on the eve of the season after spending a year with Chelmsford City. Played for St Albans City Reserves during 2000-01 and made his First XI debut three years later having had spells with Swindon Town, Lincoln City, Stevenage Borough and Farnborough Town during the meantime. His career has been blighted by injury over the past four years and periods of rehabilitation have seen him spend time at Staines Town, Leighton Town and Wealdstone. Once fully fit, he walked off with the Players’ and Supporters’ Player of the Year trophies for 2008-09.